Borrowing from Mother Nature, a team of MIT researchers has built a school of swimming robo-fish that slip through the water just as gracefully as the real thing, if not quite as fast. 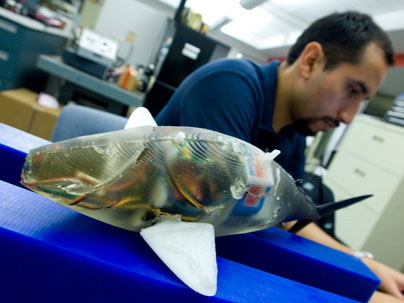 Mechanical engineers Kamal Youcef-Toumi and Pablo Valdivia Y Alvarado have designed the sleek robotic fish to more easily maneuver into areas where traditional underwater autonomous vehicles can't go. Fleets of the new robots could be used to inspect submerged structures such as boats and oil and gas pipes; patrol ports, lakes and rivers; and help detect environmental pollutants.